This would seem to point all the way back to the biblical reference of the apple which was offered to Eve by the serpent (evil/Satan). The evil queen offers Snow White the apple in much the same way. Snow White knows she should not be speaking to strangers, but she does it anyway and she pays for that mistake by falling under the spell. The number seven was used many times in the Bible for signifying perfection. The book of Revelation contains numerous groups of sevens such as angels, churches, trumpets, crowns, mountains, stars, and kings. It is one of the most significant numbers in Christianity in the sense that “God created the world in seven days”, or rather he created the world in six days and on the seventh he rested. Some people have thought to correlate the seven dwarfs with the seven deadly sins, but that correlation doesn’t hold water. In the Grimm version of Snow White, the seven dwarfs do not have names. In Disney’s version of Snow White, the dwarfs do have names but those names were chosen out of sixty or so possible names and they do not correspond to the seven deadly sins. The names of the seven dwarfs are: Dopey, Grumpy, Doc, Happy, Bashful, Sneezy and Sleepy. These names are more aptly “the seven moods of man” rather than sins. The Seven Deadly Sins are represented in the story of Snow White, but not in the form of the seven dwarfs. Pride/Vanity: Clearly the vanity of the Evil Queen. The mirror is clearly a direct reference to vanity. Gluttony: The seven dwarfs eating (maybe a stretch). 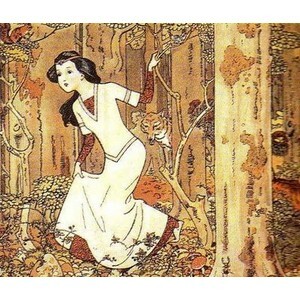 Or in the original tale, the Queen actually eats the heart of Snow White. Sloth: Originally meant sadness, melancholy,apathy, depression, and joylessness which would distract from attention to god. This applies to the dwarfs after Snow White dies and sloth in the form of sloppiness certainly applies to the seven dwarfs in their manner of housekeeping. Wrath: The wrath of the seven dwarfs upon the witch after they discover Snow White dead. The seven deadly sins have opposites in the seven holy virtues: Humility, Chastity, temperance, charity, diligence, patiences, kindness. All of these are characteristics of Snow White. Snow White “dies” and comes back to life. This certainly parallels the death and resurrection of Jesus from the Bible. The part of the story where Snow White demands that the dwarfs wash could be related to the cleansing of baptism. After the dwarfs have washed, they become people that seem to have a new purpose in life, except for Grumpy who protests the most. Grumpy does undergo a transformation throughout the movie though, from a skeptical dwarf into one that is very devoted to Snow White.